Nature-based solutions (NBS) refers to the sustainable management and use of nature for tackling socio-environmental challenges. The challenges include issues such as climate change, water security, water pollution, food security, human health, and disaster risk management. A definition by the European Union states that these solutions are "inspired and supported by nature, which are cost-effective, simultaneously provide environmental, social and economic benefits and help build resilience. The Nature-based Solutions Initiative meanwhile defines them as "actions that work with and enhance nature so as to help people adapt to change and disasters". Such solutions bring more, and more diverse, nature and natural features and processes into cities, landscapes and seascapes, through locally adapted, resource-efficient and systemic interventions". With NBS, healthy, resilient and diverse ecosystems (whether natural, managed or newly created) can provide solutions for the benefit of societies and overall biodiversity. For instance, the restoration or protection of mangroves along coastlines utilizes a nature-based solution to accomplish several things. Mangroves moderate the impact of waves and wind on coastal settlements or cities and sequester CO2. . They also provide safe nurseries for marine life that can be the basis for sustaining populations of fish that local populations may depend on. Additionally, the mangrove forests can help control coastal erosion resulting from sea level rise. Similarly, in cities green roofs or walls are nature-based solutions that can be used to moderate the impact of high temperatures, capture storm water, abate pollution, and act as carbon sinks, while enhancing biodiversity. Conservation approaches and environment management initiatives have been carried out for decades. What is new is that the benefits of such nature-based solutions to human well-being have been articulated well more recently. Even if the term itself is still being framed, examples of nature-based solutions can be found all over the world, and imitated. Nature-based solutions are on their way to being mainstreamed in national and international policies and programmes (e.g. climate change policy, law, infrastructure investment and financing mechanisms). For example, the theme for World Water Day 2018 was "Nature for water" and by UN-Water's accompanying UN World Water Development Report had the title "Nature-based Solutions for Water". Societies increasingly face challenges such as climate change, urbanization, jeopardized food security and water resource provision, and disaster risk. One approach to answer these challenges is to singularly rely on technological strategies. An alternative approach is to manage the (socio-)ecological systems in a comprehensive way in order to sustain and potentially increase the delivery of ecosystem services to humans. In this context, nature-based solutions (NBS) have recently been put forward by practitioners and quickly thereafter by policymakers. These solutions stress the sustainable use of nature in solving coupled environmental-social-economic challenges. While ecosystem services are often valued in terms of immediate benefits to human well-being and economy, NBS focus on the benefits to people and the environment itself, to allow for sustainable solutions that are able to respond to environmental change and hazards in the long-term. NBS go beyond the traditional biodiversity conservation and management principles by "re-focusing" the debate on humans and specifically integrating societal factors such as human well-being and poverty reduction, socio-economic development, and governance principles. Reduce risks associated with water‐related disasters and climate change (e.g., floodplain restoration, green roofs). In 2015, the European network BiodivERsA highlighted how NBS relate to concepts like ecosystem approaches and ecological engineering. NBS are strongly connected to ideas such as natural systems agriculture, natural solutions, ecosystem-based approaches, adaptation services, natural infrastructure, green infrastructure and ecological engineering. For instance, ecosystem-based approaches are increasingly promoted for climate change adaptation and mitigation by organisations like United Nations Environment Programme and non-governmental organisations such as The Nature Conservancy. These organisations refer to "policies and measures that take into account the role of ecosystem services in reducing the vulnerability of society to climate change, in a multi-sectoral and multi-scale approach". Likewise, natural infrastructure is defined as a "strategically planned and managed network of natural lands, such as forests and wetlands, working landscapes, and other open spaces that conserves or enhances ecosystem values and functions and provides associated benefits to human populations"; and green infrastructure refers to an "interconnected network of green spaces that conserves natural systems and provides assorted benefits to human populations". Similarly, the concept of ecological engineering generally refers to "protecting, restoring (i.e. ecosystem restoration) or modifying ecological systems to increase the quantity, quality and sustainability of particular services they provide, or to build new ecological systems that provide services that would otherwise be provided through more conventional engineering, based on non-renewable resources". The International Union for the Conservation of Nature (IUCN) defines NBS as actions to protect, sustainably manage, and restore natural or modified ecosystems, that address societal challenges effectively and adaptively, simultaneously providing human well-being and biodiversity benefits, with climate change, food security, disaster risks, water security, social and economic development as well as human health being the common societal challenges. The general objective of NBS is clear, namely the sustainable management and use of nature for tackling societal challenges. However, different stakeholders view NBS from other perspectives. For instance, IUCN defines NBS as "actions to protect, sustainably manage and restore natural or modified ecosystems, which address societal challenges effectively and adaptively, while simultaneously providing human well-being and biodiversity benefits". This framing puts the need for well-managed and restored ecosystems at the heart of NBS, with the overarching goal of "Supporting the achievement of society's development goals and safeguard human well-being in ways that reflect cultural and societal values and enhance the resilience of ecosystems, their capacity for renewal and the provision of services". In the context of the ongoing political debate on jobs and growth (main drivers of the current EU policy agenda), the European Commission underlines that NBS can transform environmental and societal challenges into innovation opportunities, by turning natural capital into a source for green growth and sustainable development. In their view, NBS to societal challenges are "solutions that are inspired and supported by nature, which are cost-effective, simultaneously provide environmental, social and economic benefits and help build resilience. Such solutions bring more, and more diverse, nature and natural features and processes into cities, landscapes and seascapes, through locally adapted, resource-efficient and systemic interventions." This framing is somewhat broader, and puts economy and social assets at the heart of NBS as importantly as sustaining environmental conditions. It shares similarities with the definition proposed by Maes and Jacobs (2015) defining NBS as "any transition to a use of ES with decreased input of non-renewable natural capital and increased investment in renewable natural processes". In their view, development and evaluation of NBS spans three basic requirements: (1) decrease of fossil fuel input per produced unit; (2) lowering of systemic trade-offs and increasing synergies between ES; and (3) increasing labor input and jobs. Here, nature is seen as a tool to inspire more systemic solutions to societal problems. Whatever definition used, promoting sustainability and the increased role of natural, self-sustained processes relying on biodiversity, are inherent to NBS. They constitute actions easily seen as positive for a wide range of stakeholders, as they bring about benefits at environmental, economic and social levels. As a consequence, the concept of NBS is gaining acceptance outside the conservation community (e.g. urban planning) and is now on its way to be mainstreamed into policies and programmes (climate change policy, law, infrastructure investment and financing mechanisms). Schematic presentation of the NBS typology. Type 1 NBS consists of no or minimal intervention in ecosystems, with the objectives of maintaining or improving the delivery of a range of ES both inside and outside of these conserved ecosystems. Examples include the protection of mangroves in coastal areas to limit risks associated to extreme weather conditions and provide benefits and opportunities to local populations; and the establishment of marine protected areas to conserve biodiversity within these areas while exporting biomass into fishing grounds. This type of NBS is connected to, for example, the concept of biosphere reserves which incorporates core protected areas for nature conservation and buffer zones and transition areas where people live and work in a sustainable way. Type 2 NBS corresponds to management approaches that develop sustainable and multifunctional ecosystems and landscapes (extensively or intensively managed). These types improve the delivery of selected ES compared to what would be obtained with a more conventional intervention. Examples include innovative planning of agricultural landscapes to increase their multi-functionality; and approaches for enhancing tree species and genetic diversity to increase forest resilience to extreme events. This type of NBS is strongly connected to concepts like natural systems agriculture, agro-ecology, and evolutionary-orientated forestry. Type 3 NBS consists of managing ecosystems in very extensive ways or even creating new ecosystems (e.g., artificial ecosystems with new assemblages of organisms for green roofs and walls to mitigate city warming and clean polluted air). Type 3 is linked to concepts like green and blue infrastructures and objectives like restoration of heavily degraded or polluted areas and greening cities. Type 1 and 2 would typically fall within the IUCN NBS framework, whereas Type 2 and moreover Type 3 are often exemplified by EC for turning natural capital into a source for green growth and sustainable development. Hybrid solutions exist along this gradient both in space and time. For instance, at landscape scale, mixing protected and managed areas could be needed to fulfil multi-functionality and sustainability goals. 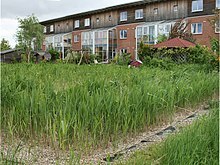 Similarly, a constructed wetland can be developed as a type 3 but, when well established, may subsequently be preserved and surveyed as a type 1. Demonstrating the benefits of nature and healthy ecosystems and showcasing the return on investment they can offer is necessary in order to increase awareness, but also to provide support and guidance on how to implement NBS. A large number of initiatives around the world already highlight the effectiveness of NBS approaches to address a wide range of societal challenges. In 2018, The Hindu reported that the East Kolkata wetlands, the world's largest organic sewage treatment facility had been used to clean the sewage of Kolkata in an organic manner by using algae for several decades. In use since the 1930s, the natural system was discovered by Dhrubajyoti Ghosh, an ecologist and a municipal engineer in the 1970s while working in the region. Ghosh worked for decades to protect the wetlands. It had been a practice in Kolkata, one of the five largest cities in India, for the municipal authorities to pump sewage into shallow ponds (bheris). Under the heat of the tropical sun, algae proliferated in them, converting the sewage into clean water, which in turn was used by villagers to grow paddy and vegetables. This system has been in use in the region since the 1930s and treats 750 million litres of wastewater per day, giving livelihood to 100,000 people in the vicinity. For his work, Ghosh was included in the UN Global 500 Roll of Honour in 1990 and received the Luc Hoffmann award in 2016. There is currently no accepted basis on which a government agency, municipality or private company can systematically assess the efficiency, effectiveness and sustainability of a particular nature-based solution. However, a series of principles are proposed to guide effective and appropriate implementation, and thus to upscale NBS in practice. For example, NBS embrace and are not meant to replace nature conservation norms. Also, NBS are determined by site-specific natural and cultural contexts that include traditional, local and scientific knowledge. NBS are an integral part of the overall design of policies, and measure or actions, to address a specific challenges. Finally, NBS can be implemented alone or in an integrated manner with other solutions to societal challenges (e.g. technological and engineering solutions) and they are applied at the landscape scale. Implementing NBS requires political, economic, and scientific challenges to be tackled. First and foremost, private sector investment is needed, not to replace but to supplement traditional sources of capital such as public funding or philanthropy. The challenge is therefore to provide a robust evidence base for the contribution of nature to economic growth and jobs, and to demonstrate the economic viability of these solutions – compared to technological ones – on a timescale compatible with that of global change. Furthermore, it requires measures like adaptation of economic subsidy schemes, and the creation of opportunities for conservation finance, to name a few. Indeed, such measures will be needed to scale up NBS interventions, and strengthen their impact in mitigating the world's most pressing challenges. Since 2016, the EU is supporting a multi-stakeholder dialogue platform (called ThinkNature) to promote the co-design, testing and deployment of improved and innovative NBS in an integrated way. Creation of such science-policy-business-society interfaces could promote the market uptake of NBS. The project is part of the EU’s Horizon 2020 – Research and Innovation programme, and will last for 3 years. There are a total of 17 international partners involved, including the Technical University of Crete (Project Leader), the University of Helsinki and BiodivERsA. In 2017, as part of the Presidency of the Estonian Republic of the Council of the European Union, a conference called “Nature-based Solutions: From Innovation to Common-use” was organized by the Ministry of the Environment of Estonia and the University of Tallinn. This conference aimed to strengthen synergies among various recent initiatives and programs related to NBS launched by the European Commission and by the EU Member States, focusing on policy and governance of NBS, and on research and innovation. In recognition of the importance of natural ecosystems for mitigation and adaptation, the Paris Agreement calls on all Parties to acknowledge “the importance of the conservation and enhancement, as appropriate, of sinks and reservoirs of the greenhouse gases” and to “note the importance of ensuring the integrity of all ecosystems, including oceans, and the protection of biodiversity, recognized by some cultures as Mother Earth”. It then includes in its Articles several references to nature-based solutions. For example, Article 5.2 encourages Parties to adopt “…policy approaches and positive incentives for activities relating to reducing emissions from deforestation and forest degradation, and the role of conservation and sustainable management of forests and enhancement of forest carbon stocks in developing countries; and alternative policy approaches, such as joint mitigation and adaptation approaches for the integral and sustainable management of forests, while reaffirming the importance of incentivizing, as appropriate, non-carbon benefits associated with such approaches”. Article 7.1 further encourages Parties to build the resilience of socioeconomic and ecological systems, including through economic diversification and sustainable management of natural resources. In total, the Agreement refers to nature (ecosystems, natural resources, forests) in 13 distinct places. An in-depth analysis  of all Nationally Determined Contributions submitted to UNFCCC, revealed that around 130 NDCs or 65% of signatories commit to nature-based solutions in their climate pledges, suggesting broad consensus for the role of nature in helping meet climate change goals. However, high-level commitments rarely translate into robust, measurable actions on-the-ground. The term NBS was put forward by practitioners in the late 2000s (in particular the International Union for the Conservation of Nature and the World Bank) and thereafter by policymakers in Europe (most notably the European Commission). The term "nature-based solutions" was first used in the late 2000s. It was used in the context of finding new solutions to mitigate and adapt to climate change effects, whilst simultaneously protecting biodiversity and improving sustainable livelihoods. ^ a b "thinknature". Retrieved 21 March 2018. ^ "'Nature-based solutions' is the latest green jargon that means more than you might think". Nature. 541 (7636): 133–134. 2017-01-12. Bibcode:2017Natur.541R.133.. doi:10.1038/541133b. ^ a b c d e Eggermont, Hilde; Balian, Estelle; Azevedo, José Manuel N.; Beumer, Victor; Brodin, Tomas; Claudet, Joachim; Fady, Bruno; Grube, Martin; Keune, Hans (2015). "Nature-based Solutions: New Influence for Environmental Management and Research in Europe". www.ingentaconnect.com. doi:10.14512/gaia.24.4.9. Retrieved 2019-02-11. ^ a b Jackson, D.L. 2002. The farm as natural habitat: reconnecting food systems with ecosystems. Washington D.C.: Island. ^ Dudley, N. et al. 2010. Natural solutions: protected areas helping people cope with climate change. Gland: World Wide Fund for Nature. ^ a b Cowan C., C. Epple, H. Korn, R. Schliep, J. Stadler (Eds.). 2010. Working with nature to tackle climate change. Report of the ENCA/BfN Workshop on "Developing ecosystem-based approaches to climate change – Why, what and how, https://www.bfn.de/fileadmin/MDB/documents/service/Skript264.pdf". Bonn: Bundesamt für Naturschutz. ^ a b Smith, M., S. Barchiesi, S. 2009. "Environment as Infrastructure: Resilience to Climate Change Impacts of Water Through Investments in Nature" Perspectives on Water and Climate Change Adaptation. IUCN: Gland, Switzerland. ^ a b Benedict, M.A., E.T. McMahon. 2006. Green Infrastructure: linking landscapes and communities. Washington D.C.: Island. ^ a b Borsje, B.W. et al. 2011. How ecological engineering can serve in coastal protection. Ecological Engineering 37/2: 113–122. ^ a b Barot, S., J.C. Lata, G. Lacroix. 2012. Meeting the relational challenge of ecological engineering within ecological sciences. Ecological Engineering 45: 13–23. ^ a b European Commission. 2015. Towards an EU Research and Innovation policy agenda for nature-based solutions & re-naturing cities. Final Report of the Horizon2020 Expert Group on Nature-Based Solutions and Re-Naturing Cities. Brussels: European Commission. ^ Alteri, M.A. 1989. Agroecology – a new research and development paradigm for world agriculture. Agriculture, Ecosystems and Environment 27: 37–36. ^ Lefèvre F. et al. 2014. Considering evolutionary processes in adaptive forestry. Annals of Forest Science 71: 723 – 739. ^ a b c United Nations Framework Convention on Climate Change (UNFCCC) database on ecosystem-based approaches to adaptation. ^ Ghatak, Aditi Roy (17 February 2018). "The wetlands will weep today". The Statesman. Retrieved 8 March 2018. ^ Ghosh, Dhrubajyoti. "The Calcutta Wetlands: turning bad water into good" (PDF). www.dhrubajyoti.net. Changemakers (issue October 2008). Retrieved 8 March 2018. ^ Ghosh, Dhrubajyoti (2 October 2014). Ecosystem management – towards merging theory and practice (PDF). New delhi: Nimby books. ISBN 9788190657044. Retrieved 8 March 2018. ^ Aseem, Shrivastava (8 March 2018). "The ecologically subsidised city: on Kolkata's wetland communities". The Hindu. Retrieved 8 March 2018. ^ "Global 500 environmental forum". www.global500.org. United Nations. Retrieved 8 March 2018. ^ Nikolaidis, Nikolaos P.; Kolokotsa, Dionyssia; Banwart, Steven A. (2017-03-16). "Nature-based solutions: business". Nature. 543 (7645): 315–315. Bibcode:2017Natur.543..315N. doi:10.1038/543315d. ISSN 0028-0836. ^ "Nature-Based Solutions, Tallinn, 24–26 October 2017". Retrieved 21 March 2018. ^ "Nature-Based Solutions Policy Platform". www.nbspolicyplatform.org. Retrieved 2018-09-13. ^ "Nationally Determined Contributions (NDCs) | UNFCCC". unfccc.int. Retrieved 2018-09-13. ^ "Ecosystem-based adaptation: a win–win formula for sustainability in a warming world?". July 2016. ^ Faivre, Nicolas; Fritz, Marco; Freitas, Tiago; Boissezon, Birgit de; Vandewoestijne, Sofie. "Nature-Based Solutions in the EU: Innovating with nature to address social, economic and environmental challenges". Environmental Research. 159: 509–518. Bibcode:2017ER....159..509F. doi:10.1016/j.envres.2017.08.032. ^ MacKinnon, K., C. Sobrevila, V. Hickey. 2008. Biodiversity, climate change and adaptation: nature-based solutions from the Word Bank portfolio. Washington D.C.: World Bank. ^ Mittermeier, R. et al. 2008. A Climate For Life: Meeting the Global Challenge. Arlington, VA: International League of Conservation Photographers. ^ IUCN (International Union for the Conservation of Nature). 2009. No time to lose – make full use of nature-based solutions in the post-2012 climate change regime. Position paper on the Fifteenth session of the Conference of the Parties to the United Nations Framework Convention on Climate Change (COP 15). Gland: IUCN. ^ "Global Climate Action Summit kicks off today in San Francisco with nature-based solutions high on the agenda". Global Climate Action Summit kicks off today in San Francisco with nature-based solutions high on the agenda. Retrieved 2018-09-13. Nature-based Solutions Initiative - consolidating evidence for the effectiveness of nature-based solutions to climate change adaptation. Nature-based Solutions Policy Platform - explore how the world's nations including nature in their climate change policy. What are nature-based solutions to climate change? An animation produced the Nature-based Solutions Initiative. "Climate : Nature-based solutions for climate change mitigation and adaptation in Paris Region par NATUREPARIF". Dailymotion. 2015-11-24. Retrieved 2018-01-19. "Nature-Based Solutions". European Commission. Retrieved 2018-01-19. "Nature-based Solutions". IUCN. 2016-09-27. Retrieved 2018-01-19. This page was last edited on 3 April 2019, at 15:39 (UTC).